One of my favorite ways to revamp a room is by shifting around some of the furniture from other rooms. I have done this since I was a teenager and in every house we’ve lived in. As I’ve gotten older, I have become more a “creature of habit” so I don’t feel the need to rearrange every week, but I’m still known to get a little shifty from time to time. This is especially great if you are someone who likes change. Switching around rooms is a great way to create something totally new without maxing out the credit card on something new. So if you’re growing tired of a room’s arrangement, or are ready to toss an old piece of furniture, maybe ask yourself if it can still serve a purpose somewhere else. Thrift store popularity is on the rise and that is a darn good thing in my book! Personally, I love shopping thrift stores, because Joanna Gaines does it. Seriously though, this is the best way to really find your own style. Things aren’t strategically laid out for you like they are in most department stores which means when something catches your eye you know it’s because you like it, not because it was designed to be eye-catching. Shopping at thrift stores really gives you a chance to find unique items that speak to you. No fabulously photographed catalog to try to convince you to buy it. When thrifting, I often I grab items and hold them and think about them and imagine them in my home. Some I put back, some I hang on to. Not only can you save huge by doing this but it really helps create an environment that is unique to you. Bonus…this is a great way to also help the environment be reusing materials we are saving them from ending up in our landfills! If you are hoping to clear house and make some cash, I highly recommend you use Decluttr if you are looking to find a quick and effective way to make some money on your used stuff! My mother thinks I have no emotions about my family or the past because I don’t have photos hanging on my walls. I used to be a photographer…so what in the world happened there? Well, the truth is, I don’t like cheesy posed photos. They seem dishonest (trust me…I was a photographer…most are very dishonest) and the candid ones I would prefer to put in to a scrapbook or year book of our lives to look back on like a well organized stroll down memory lane. Instead, I take the small things left behind by my family members, my mom included; things that I remember seeing in a family members home or items that they made. Anything that made a lasting impression on me and reminds me of that particular person or time in my life. Again, minimalism to me isn’t about not having any stuff…it’s about being very selective in the pieces I choose to keep. 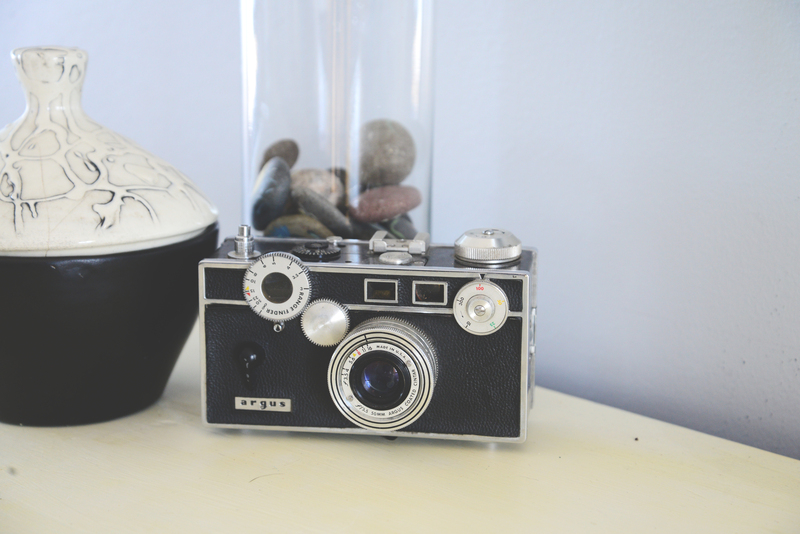 Grandma’s container, grandpa’s camera, rocks in vase painted by my grandma. 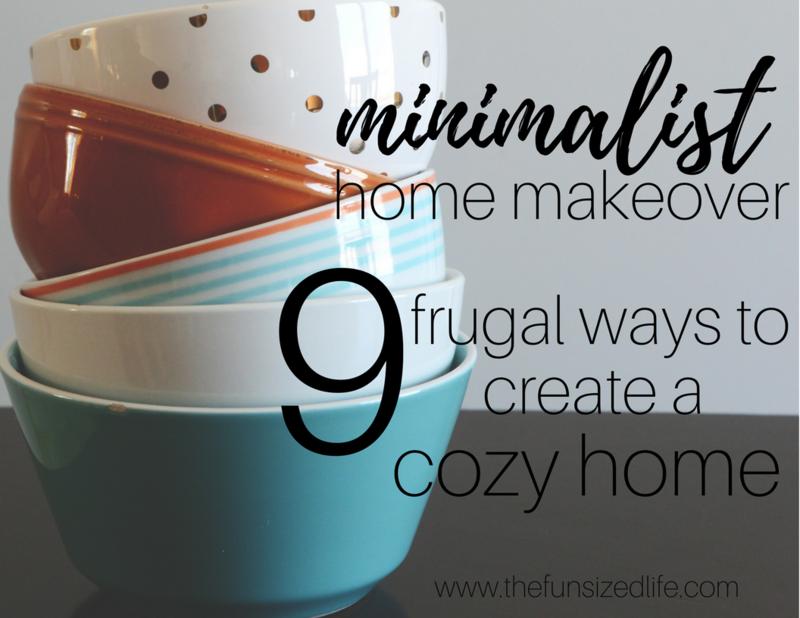 Stress Free Minimalism: Have Minimalism and Your Stuff Too! Chalk Paint has been quite possibly the best discovery of my life. While I am what you might call and “artsy” person, I am definitely not a patient person. Scrolling Pinterest, you will no doubt come across all of these great DIY home projects in which all the furniture looks amazing in the end thanks to chalk paint. I have always loved the idea of this, but have known I don’t have the patience for it. By that I mean I don’t have the patience to clean all the nooks and crannies, sand down the old wood…then wash again… I try to be this patient, and I can usually make it through a quick cleaning but after that all bets are off. That’s why I turn to chalk paint every time. Chalk paint is very forgiving when it comes to get ‘er done people like me. Because I love that vintage look. Because I have been a stay at home mom for almost a decade. I know things don’t stay nice. May as well beat my kids to the punch. Read here to see my Chalk Paint in action plus all the best tools and tips. Not to be confused with chalk paint! When we bought our house the living room and kitchen walls were red and brown. Tom and I knew we would want different colors through the house so we made sure to paint RIGHT AWAY! While painting can be a very time consuming process, it is usually relatively inexpensive and makes a HUGE different when it comes to the appearance for a room. We made sure to paint our kids room’s as well. Even though we loved the simple grey color, we wanted to instantly make their rooms feel at home and inviting to them. Have you ever looked at artwork in stores?! Maybe I’m just a total cheapskate frugal enthusiast but my jaw literally drops to the floor when I see some of the prices on a giant piece of artwork designed to look like paint blobs. Don’t get me wrong, I love the paint blobs…that’s why I check the price, but those things are spendy! That’s why I tend to gravitate toward creating my own artwork. If you are a Joann Fabric fan like I am, this is the perfect chance to take full advantage of those coupons and you can often get additional money back by using your Ibotta app! Read my full Ibotta review here. Another way to never get bored and still have fun artwork is to get a chalk board. We have one that I tend to change with the seasons. It keeps things fun and different and I am still able to always give my own personal touch! Creating your own chalk board is very easy too! 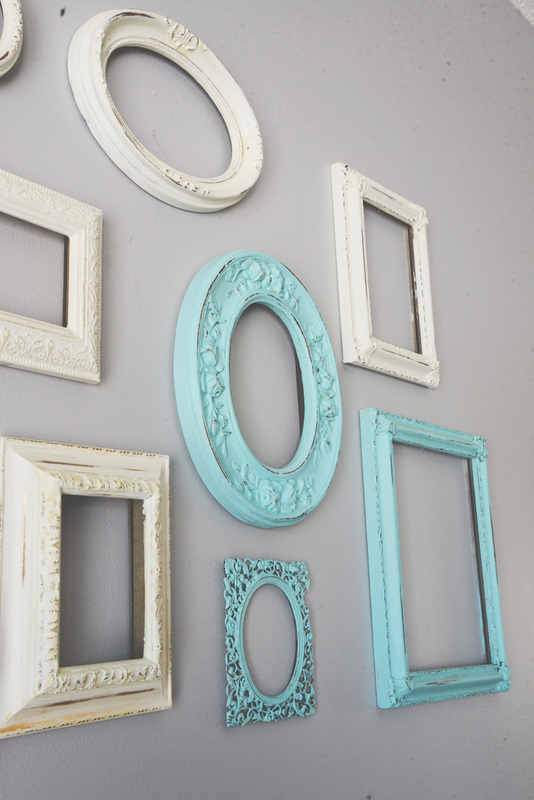 You simply need a large picture frame or mirror and some chalk board paint! In fact we painted an entire wall in our son’s room to be a chalk board wall! Don’t worry, I’m not talking about fully gutting and repurposing your furniture, although, if you can do that, you are my hero! I mean when you have something that you feel has no more purpose or use in your house, take a moment to think about if it really does have a different purpose somewhere else. As I was going through our kitchen to declutter, I came across this old, round cake pan. I already have newer cake pans, so I know I didn’t need this one anymore. However, our coffee grounds were always spilling by our “coffee station.” What if I used this pan to keep everything together and prevented my counter tops from always being dirty. Naturally, I checked with my Instagram followers to make sure everyone approved of this brave interior design move I was making! Feel free to let me know what you think in the comments! All I know is, I really enjoy not having coffee grounds all over the place! Plus my souvenir Friends cup needed a nice home! My new favorite “style move” is also huge when it comes to saving money! 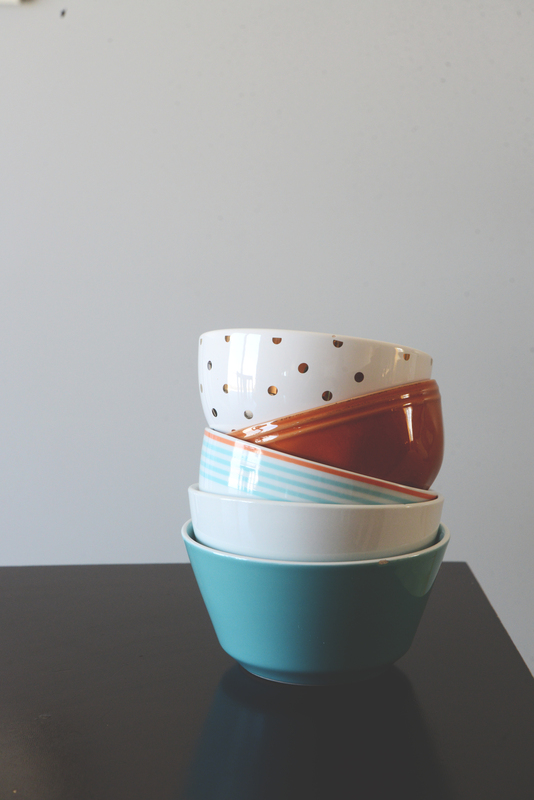 At a recent trip to Target I found myself stressed because there were so many cute bowls on the clearance rack. They were all different and unique and I liked them all. Then I began to realize, they all really went together nicely, even though they didn’t match or come in a set. I have taken the liberty of linking directly to Target’s dinnerware section so you can browse a bit. While there is a lot of gorgeous stuff, I recommend keeping those eyes peeled for the times when Target drastically reduces prices on the loose dinnerware. That’s where I strike gold. When I first brought home my mixed up bowls, I hesitantly told my best friend about my new strategy to have all mismatched dinnerware. Of course, she gave me even more faith behind my decision when she said she hates when plates or bowls break and she feels this obligation to have to buy the whole set again! I never thought of that! Mis-matched also means replacing your broken stuff is that much easier and more cost effective! This one is my favorite. Yes, we painted our house when we first moved in, we even got a few new light fixtures but there were a few things we didn’t get: an entertainment center and bar stools. Having no bar stools was tough because in our old house we had gotten used to gathering around the island to have breakfast. Now our island was deserted. But, I had my eye on some perfect stools and since we were in the process of paying off our debts, I didn’t want to take any funds away from that. So I saved. I waited and saved for 4 stools that wound up costing a little over $200. That might not seem like much, but the old me would have just charged them if the funds weren’t available. Charging and digging debt was the exact opposite of the direction I wanted my life to go and so, I didn’t do it. Holding our and delaying gratification for a piece (or pieces) that you truly want in your home is always worth it! If you find something that you just have to have and you just can’t afford it…save for it. Those stools do a lot more than give us a place to gather for breakfast now. They serve as a reminder that patience and perseverance pay off! To be a part of a supportive financial community, join my Facebook group, Fun Sized Budgeters. It’s a place to interact and ask questions from others who may be facing similar struggles! Great tips you’ve proved. Thank you. Great tips! I love moving decorations from room to room to mix it up. Me too! It’s such an easy way to create a whole new space! I am all about the repurposing! Love your cake pan story! Sound like something I would do! Great tips! Thanks Jen, I’m pretty proud of having found a cute little place for it! Yes! I love shopping small businesses as well! So proud of you, lil cuz! Because of reading your articles, I am going through my stamping room and getting rid of things I don’t absolutely love! If I don’t get warm and fuzzies, it is going to the for sale or trash pile! YAY! It makes life so much more clear when you only let in the stuff that means the most. I went through the kid’s rooms today and got rid of anything that didn’t give me the warm and fuzzies! HAHA! I’m a big fan of charity shops for all kinds of things. I was looking for some plates a couple of years ago and the only place I found what I wanted was the charity shop. Pop them in the dishwasher and they’re good to go. Me too! I’m cool with a dishwasher and good as new mindset! I love your tips! I’ve been known to get a little “shifty” myself and I love the difference that new paint color can make. I recently started working with chalk paints and have even painted a few pieces of furniture that we had considered getting rid of. New paint makes me love them even more now and it was way more economical than buying new furniture! I love that!! It’s like getting a whole new piece of furniture with out being wasteful or spending unnecessary money! Thank you for the great tips! Definitely gonna use some of them! Lol, hadn’t thought about distressing as beating your kids to the punch! I love this take on minimalism because I feel like lots of minimalism bloggers buy high-end decor that I can’t afford. I’d like to highlight a few of our family heirlooms better. There are some great advice, thank you for sharing! Hygge has inspired me SO much more to shop secondhand. It makes a big difference! Ahhhh Christmas. It’s like Armagedon. haha. Huh. These tips are actually great and different than the same old same old I often find on my quest to stay frugally inspired while we pay off debt. Love the mismatched dish idea and decorating with special objects. Great post! Glad I stumbled across it! Chris, I’m so glad you benefited from this post! I really try to avoid the same ‘ol things we hear all the time! I appreciate you sharing!